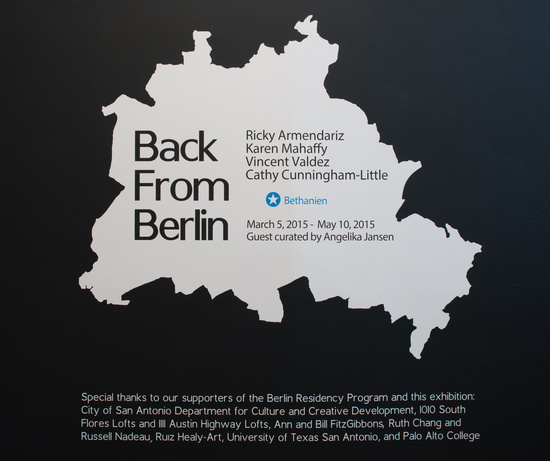 Presenting Ricky Armendariz, Vincent Valdez, Cathy Cunningham-Little, and Karen Mahaffy, Back From Berlin features works each artist made while at, and since their return from the Künstlerhaus Bethanien. Selected for the Blue Star Contemporary Berlin Residency Program, these Bexar County artists worked and lived in Berlin, Germany for three-months each, from July 2013 thru June 2014, the program’s inaugural year. This exhibition was guest curated by Dr. Angelika Jansen. A former gallery owner with international, national, and local curatorial experience, Jansen is an avid supporter of the San Antonio art community and was integral to the establishing of the Blue Star – Künstlerhaus partnership. Spending part of her time in San Antonio and part in Berlin, Jansen also acts as a liaison for Blue Star residents during their time in Berlin, visiting their studios and acclimating them to the city. “…How wonderful for all of us involved in making this residency possible that our hopes were more than fulfilled. All four artists came back raving about their experiences, how they are looking differently at creating art. For them there is a definite before and after Berlin. Their exhibition at Blue Star will allow a glimpse into this process,” says Jansen. 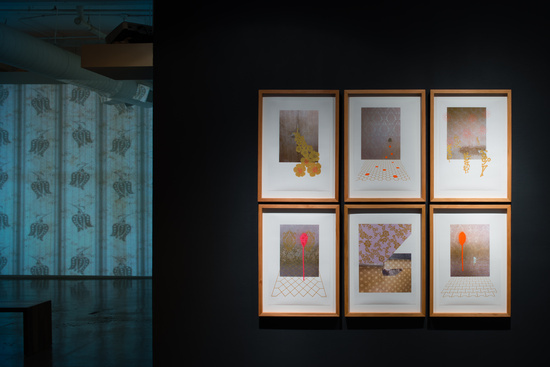 Each of exhibiting artists’ works direct the viewer’s attention to subjects, events, or themes, that are often peripheral or forgotten, in a way that is contemplative and poetic. In Valdez’s work there is frequently a retelling of histories both personal and culturally shared. Moments are frozen and made slightly decontextualized, bringing a simultaneous stillness to the viewer and subject in front of him or her. Working with light, shadow, color, and glass as her primary materials, Cathy Cunningham-Little’s work explores perceptual phenomena, illusion, and the metaphysical. The interactions of her materials create an experience in which the boundaries between substance and space are made ambiguous, causing viewers to question the nature of perception and to consider the expansion of their state of consciousness. Influenced by the landscape of the American Southwest, Ricky Armendariz’s work explores narratives associated with this space, some folkloric, some historic, and some current. Often Armendariz points to the romanticizing of the landscape and the hybridization of Mexican, American, and indigenous cultures, with vivid color, graphic line work, and a sensibility that is subtlety humorous, mysterious, and melancholic. Karen Mahaffy endeavors to produce works that capture the extraordinary contained within the ordinary, with the express intent of questioning our capacity to recognize it. She seeks to articulate and employ the seemingly insignificant elements that exist within and between familiar places, objects and actions and in particular, to examine how evidence of place and time can manifest itself in unexpected ways. Supporters of the 2013 – 2014 cycle of the program and this exhibition include: City of San Antonio Department for Cultural and Creative Development, the University of Texas San Antonio, Palo Alto College, 1010 South Flores Lofts and 1111 Austin Highway Lofts. The 2014-15 Blue Star Contemporary Berlin Residency Program is made possible in part by the support of City of San Antonio Department for Culture and Creative Development, 1010 South Flores Lofts and 1111 Austin Highway Lofts, Ann and Bill FitzGibbons, Ruth Chang and Russell Nadeau, and Ruiz-Healy Art.